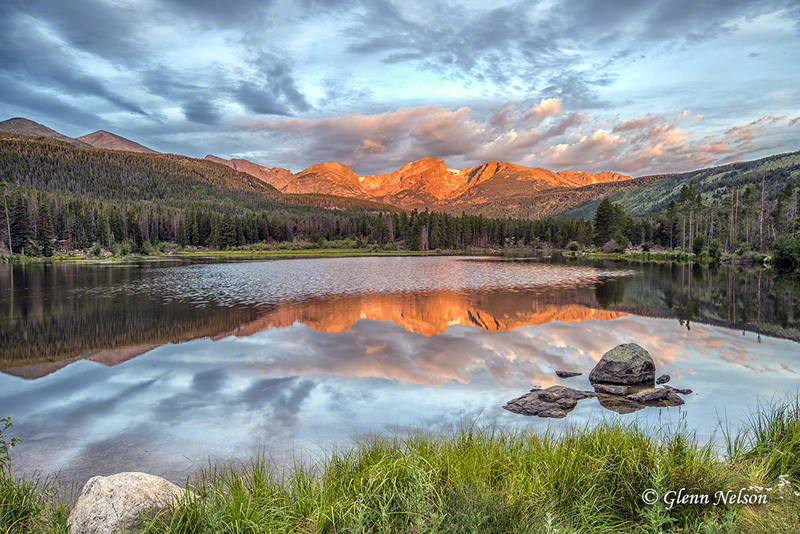 Sunset over Hallet’s Peak and Bear Lake in Rocky Mountain National Park. Most of the time, the learning process is like stacking blocks. One thing not only leads to another, it supplements and illuminates the other. I have been thinking about this as I’ve worked on my photos from Rocky Mountain National Park. I had decided to try my hand at landscapes and cityscapes after knee surgery prevented me from lugging my big lens out into the field. At times, I’ve thought the whole landscape thing was a lot more fun than shooting birds. Then, another day, like at RMNP, I think how cool was it to photograph so many majestic and interesting mammals. (NOTE: Clicking on an image will open a larger version in a separate browser window). But maybe it’s both ways. Looking now at my wildlife shots from last week, I’m seeing the influence of my landscape experience. With my bird photographing, I’ve focused mostly on showing the animals doing something. In RMNP, I showed a lot of the animals in interesting environments. In that vein, my favorite shots from Mile High Mammals were the Yellow-Bellied Marmots sunning themselves on the rock and the young Bighorn Sheep ram by the wildflowers. In those, it is as much the context of the photos as it was the subject that stand out. The thing about the young ram photo is that it also followed the “rule” about getting “good eye” in an animal picture. Are all rules made to be followed — always? I think not. The photo that leads this post breaks one of the landscape rules about having a foreground object. Maybe a “real” photographer or artist will give me grief, but I like the Bear Lake photo better than others because I just do. The sky is nice, and so are the colors. I really, really tried to find a foreground object (believe me, I ran around,looking), but, as many of you know, the good light waits for no one. So I didn’t want to lose it, just as I wanted to take advantage of the glassy smooth lake. The following arguably has nicer light, and two reflections, but seems somewhat less dramatic. It’s the clouds, right? Plus the glassiness of Bear Lake vs. Sprague Lake, which is getting touch by a little wind. 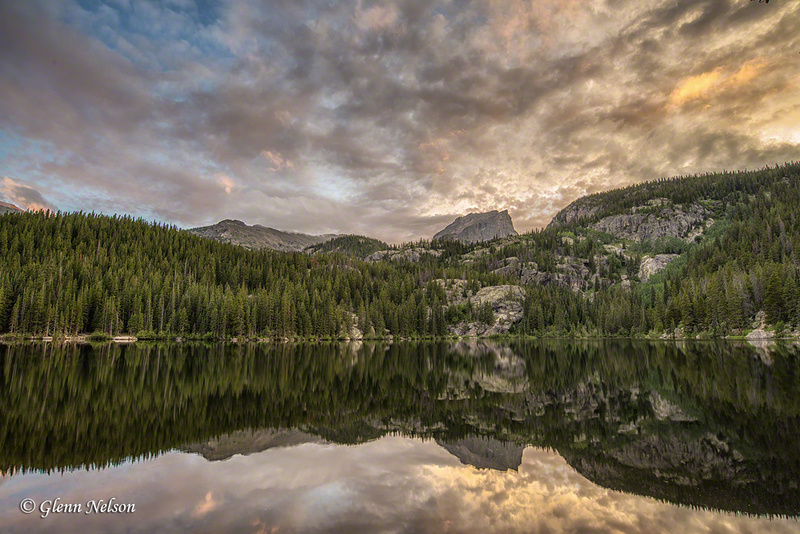 The sun rises over Sprague Lake in Rocky Mountain National Park. But here’s a rule that seems always to be true: Staying too long with light is like sticking too long in a flawed relationship. The pop and excitement fades and it becomes difficult to see anything beautiful. It’s a lesson I’ve learned early in taking my camera outdoors. It happens quickly. So the photo above is the only one of a true sunrise because, after you get that first flash of light, its reflections elsewhere are where the glory lies. The shots that follow are the early sun shining off the peaks on the opposite side of Sprague Lake. The lesson: always be looking around, even behind you. Your next shot likely isn’t right in front of you anymore. The rising sun imparts an orange glow to Otis Peak, Hallet Peak and Flattop Mountain. 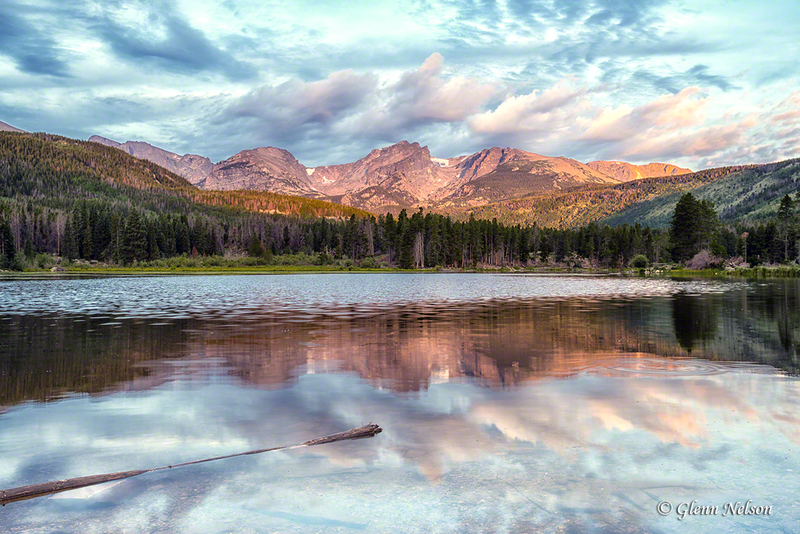 The rising sun reflects off the peaks on the west side of Sprague Lake. Notice how luck played into these last three at Sprague Lake, especially the first two? I got clouds, which are not ever-present in the Rockies like they are in the Pacific Northwest, where I live. Clouds give the light something to reflect off, thereby giving us the great oranges and pinks. 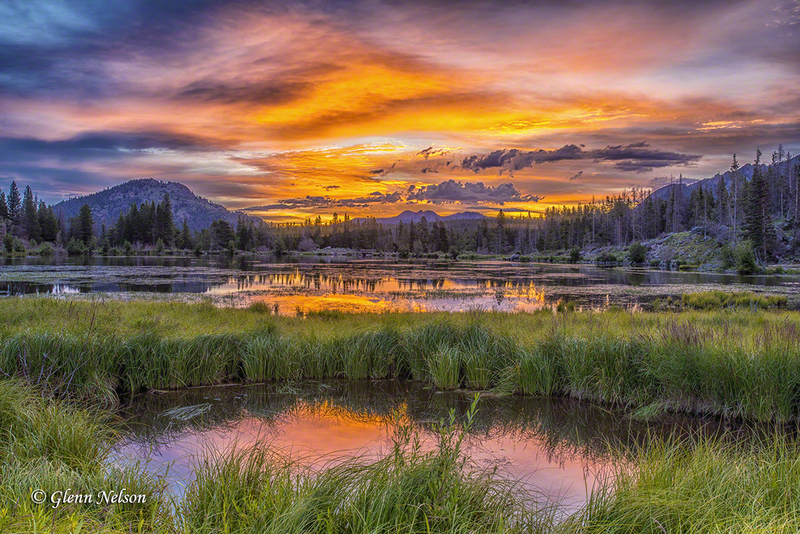 The three Sprague Lake images were captured within minutes of each other. All had a different foreground object, plus different repeating patterns, but also different light. I’m not sure if I’m really proud of any of those three. I’m most partial to the first and third — because of the colors (read: light). But even though they are compositionally superior, I don’t like them better than the Bear Lake sunset. The clouds were a little more dramatic at Bear Lake and the surface of the lake is perfect. Those elements of luck helped me overcome the absence of any decent foreground subject matter. Superb images Glenn. I must get over there.